Yes, it’s another recipe with stevia. You know you can sub real maple syrup for stevia, right? As for me, I’m loving the non-sugar treat options. :) If you’d like to grab some stevia for free, here’s how to do it. It was a hot day and I didn’t want to heat up the oven to bake. I had some Chocolate Whipped Cream in the fridge and wondered what would happen if I stirred cream cheese into the bowl. I decided it would surely be great. And that peanut butter stirred in would be even better. And that all of these ingredients together would actually create a delicious cheesecake. And really, that’s about it. So that’s the end of my story. By the way, it’s a pet-peeve of mine to see a sentence begin with the word and. And that’s why I rarely do it. And I feel that my 7th grade English teacher, Mrs. Heaton is surely proud of me for this. And I’m sure you agree. I also don’t like writing sentence fragments, but the above story made me do both. Yes, I wrote sentence fragments that began with the word and. I must need another piece of cheesecake. 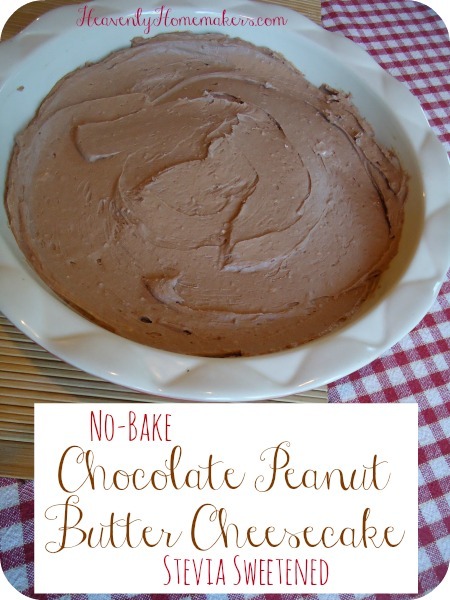 So, No-Bake Chocolate Peanut Butter Cheesecake. We made this for Father’s Day. I promise that making it won’t change your grammar skills for the worse. Worst. Worser. Never mind. Whip all ingredients together until smooth. 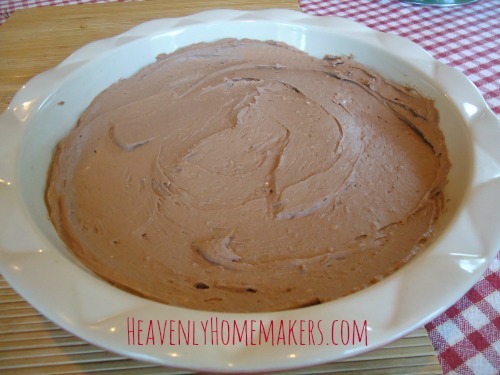 Spread mixture into a pie dish (with or without a crust). Place pie in freezer for at least one hour before serving. We found that no crust was necessary with this cheesecake, mostly because I was too lazy to make a crust. Laziness should never help us make decisions, just like sentences should rarely begin with the word and. But a cheesecake without a crust is still delicious. And that’s all there is to it. Did you make anything special for Father’s Day? And am I the only one who doesn’t like seeing sentences begin with the word and? My question though is this; How are you able to find Heavy Whipping Cream without polysorbate 60 or 80 in it? Every single one I have come across has it in the ingredient list which really irks me to no end because I can’t make many recipes that call for Heavy Whipping Cream because of these additives. Considering what they do to the human body I would like to stay far, far, away from them. We get it from our local farmer when we can. Otherwise, we compromise and get it from the store. If this is helpful, Horizon Organic Heavy Whipping Cream from Costco has Organic grade A cream, sodium citrate and carageenan, but not the other things you mentioned. Thank you and I appreciate the reply. Though I am glad they are offering “organic” heavy whipping cream, it’s a shame they have to add “carrageenan ” (red seaweed) in it especially since the solvents they use to extract are so toxic, even in it’s undegraded state it has shown to cause inflammation in the body … with my arthritis, I’ll pass. I guess I’ll just have to find a local farm with raw milk to get my cream. this may be a little late, but today I made this recipe and I used Kolona Super Natural Whipping Cream. The only ingredient, says the label, is Grade A Cream. I get it at Whole Foods or Vitamin Cottage Natural Grocers. My husband does not do well with any other whipping cream. We’ve used it for several years. Did you whip the cream before adding the other ingredients? Or just dump it all together and then whip? Thanks! Chocolate and peanut butter are two flavors that were meant to go together, in my opinion, but I’ve never had them in a cheesecake. I love that you can do this without the crust, as I am often too lazy to want to make a crust. That being said, I can imagine it is delicious with a chocolate crust. I’ll have to give this one a try – thanks for the recipe! “If” there are any leftovers – do you store in the freezer or refrigerator? Looks yummy. This sounds and looks wonderful! Any idea on how much powder stevia equals 4 droppers of liquid stevia?